HomestayKorea ::: FAQ - For Guest - Will my electronic devices (iPad/Laptop/Phone/etc.) work in Korea? Will my electronic devices (iPad/Laptop/Phone/etc.) work in Korea? Some devices will work, while others will not. If you check the back (or battery) of most devices, it will list the range of voltage that these devices can work. Korea's voltage is 220V (some places with 240V). If your device is only capable to run at 110-120V, then it will not work in Korea. 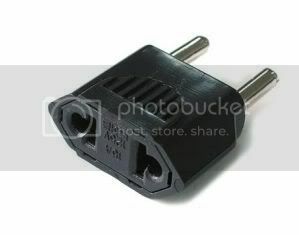 Also, devices from the U.S. and most other countries have a different plug shape for wall sockets. If you plan to use overseas devices, you will most likely need to purchase an AC adapter (pictures below of AC adapter and various plug shapes from other countries), however, this will not solve the difference in voltage, only the plug shape. if your device can't function at 220V, do not plug it into a Korean wall socket. You can usually purchase an adapter to attach to your plug at the airport (Incheon Int'l Airport carries them) or in Yongsan at an electronics store. Below is a more detailed explaination of how to check if your device will work in Korea. You’ll find that plugs that come with two flat pins usually are built for 110-120V and plugs with two round pins are built for 220-240V. Let’s address the most pressing difference first: VOLTAGE, measured in volts (V). Korea generally runs a voltage of 220-240V so that must be taken care of first. But before you go out and buy a new travel razor or cell phone charger, check the backside of your device. If you take a look at the power brick of most electronics, many mid-to-high end electronics already have the voltage capabilities to function perfectly fine in Korea, as well as other countries. For example, my laptop power brick lists the device is capable to run from 100-240V. Perfect! However, my electric shaver is rated at 120V only - so it must stay in the U.S.
Once you have identified what will not explode once plugged in, now you must find something to change the plug/prong shape. Below is a cheap and good adapter that attaches to the end of your appliance. The one pictured below is for U.S.A -> South Korea. Also, don’t panic - this adapter only costs about $1.00 (1,100 KRW) in Korea and can be bought at Incheon Int'l Airport or in Yongsan electronics district. Another common solution specifically for laptops is purchasing a new cord that connects from the power brick to the wall outlet. Consider that the three-prong female-end laptop cord is somewhat universal in design. Where the difference lies is the regional plug shape. Meaning, if you went to a Korean electronics store (best place to find would be in Yongsan electronics district in Seoul), you can buy a quality laptop cord to go from your power brick to the wall. I think they run less than 10,000 KRW (around $10.00). Below is a list of common plug types. If you see a red X, you need a plug adapter. Transformers (트랜스퍼머) step down the voltage to a native-like level for several hours. 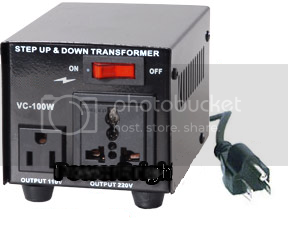 It isn’t recommend to use such transformers for extended periods of time, such as days or weeks at a time, because the electricity being stepped down isn’t always “clean”. Worried about charging your DS or iPhone? Don’t be. Transformers are safe, just remember that they are not a good idea for devices like TVs, laptops, or other long-term use appliances. During Homestay Will my electronic devices (iPad/Laptop/Phone/etc.) work in Korea?